New Zealand’s first ever Changing Places accessible bathroom has opened in Hamilton. It is located at Hamilton Gardens and features a height-adjustable adult sized change table with a shower, and an electronic hoist. It also includes privacy screens and enough space to allow for two caregivers. The bathroom is the result of a partnership between Hamilton mother Jenn Hooper and Hamilton City Council. 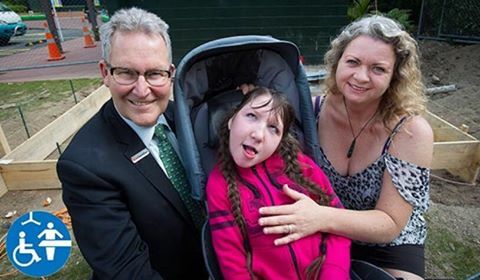 Hooper, inspired by her profoundly disabled daughter Charley, has been working extensively for several years on bringing Changing Places to New Zealand. “With its worldwide reputation and the wide variety of social events and activities on offer year round, the Hamilton Gardens is the perfect venue to showcase these facilities,” she says. The Changing Places facility is situated near the new Destination Playground at the gardens. “We pride ourselves on catering to all visitors and the construction of the Changing Places toilet reinforces that, allowing more people to enjoy the gardens,” says Hamilton Gardens Director, Dr Peter Sergel. Changing Places was first established in the United Kingdom in 2006. It now has more than 1,000 facilities of this kind nationwide. There are also more than 20 Changing Places in Australia. People needing access to the facility have to register first, and then are provided with either a swipe device or can enter through a mobile phone app.